Native bees could use a little help from humans to keep them healthy. 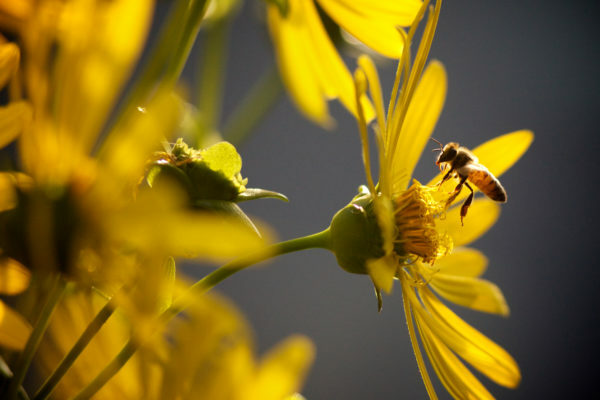 Necessary in the ecosystem for pollination, Frank Drummond, a University of Maine professor of insect ecology, suggested a few things people can do to help save bees. 1. If you have an open meadow or field on your property, mow it periodically to keep it that way. Bees do better with open terrain than they do with forested land, and it can be a matter of mowing or bush-hogging a field every year or two to keep the growth down. Open fields support wildflowers, Drummond said, and wildflowers support bees. 2. Strive to cut back or eliminate home pesticide use. Do you really need a manicured, perfect green lawn? Pesticides are toxic to bees and can kill them immediately or after the bees return to the hive. One of the plants commonly considered a weed that can be a common target of pesticides, the dandelion, is actually great forage for bees. So letting your dandelions bloom can help to save bees. 3. Plant a bee garden that will nourish bees and other pollinators, and try to find different flowers that will bloom at different times of year. According to the Honeybee Conservancy, bees like crocus, hyacinth, borage, calendula and wild lilac in the spring, bee balm, cosmos, echinacea, snapdragons, foxglove and hosta in the summer and zinnias, sedum, asters, witch hazel and goldenrod in the fall. But be careful to skip highly hybridized seeds, which don’t produce much pollen, or plants that already have been treated with pesticides. Some big-box stores sell some flowers and plants that are certified to be pesticide-free. 4. Be proactive in your community. Encourage town officials to skip pesticide application on public land, and to wait to mow flowers and grasses growing on the edges of the roadside until after peak bloom to give the bees a chance to access the pollen.